nourish me and BioCare® invites you to participate in our expert discussion on gut and intestinal health in practice. 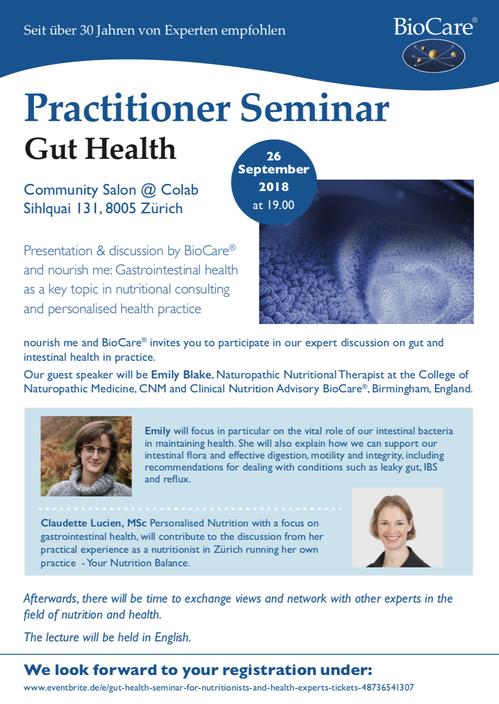 Our guest speaker will be Emily Blake, Naturopathic Nutritional Therapist at the College of Naturopathic Medicine, CNM and Clinical Nutrition Advisor BioCare®, Birmingham, England. Emily will focus in particular on the vital role of our intestinal bacteria in maintaining health. She will also explain how we can support our intestinal flora and effective digestion, motility and integrity, including recommendations for dealing with conditions such as leaky gut, IBS and reflux. Afterwards, there will be time to exchange views and network with other experts in the field of nutrition and health. The lecture will be held in English. For our customers and anyone interested in nutrition, health and wellbeing, we recommend the following event on the 26th of September.